EIA’s October 2018 Short-Term Energy Outlook (STEO) forecasts Brent crude oil spot prices, which averaged $79 per barrel (b) in September, to average $81/b in the fourth quarter of 2018, before falling to an average of $75/b in 2019. However, the effects of the U.S. withdrawal from the Joint Comprehensive Plan of Action (JCPOA), the re-imposition of sanctions on Iran, and the potential response from members of the Organization of the Petroleum Exporting Countries (OPEC) and other countries pose significant uncertainty to the forecast. EIA forecasts Brent crude oil prices to average $81/b in the fourth quarter of 2018, reflecting the recent upward price movement and the possibility that crude oil prices could remain elevated while market participants assess the effects of the sanctions. 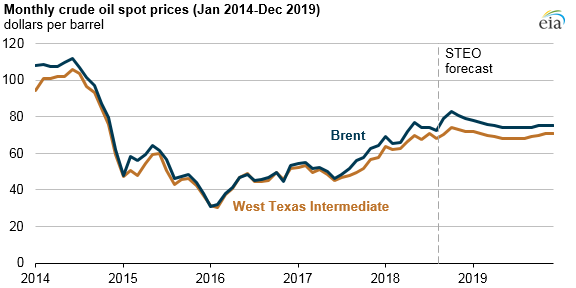 EIA forecasts West Texas Intermediate (WTI) prices to increase at a slightly slower rate, leading to a widening of the Brent-WTI spread to $9/b in October. EIA forecasts the spread to narrow to $4/b by December 2019. The May 2018 announcement that the United States would withdraw from the JCPOA and reinstate sanctions against Iran included two wind-down periods, the second of which will end November 4 and includes a number of measures that target Iran’s energy sector. The October STEO assumes that the effects of sanctions will increase during the first few months of full implementation and that Iran's average crude oil production (excluding condensate) in 2019 will fall by approximately 1.0 million barrels per day (b/d) from Iran’s April 2018 production level of 3.8 million b/d. This decline is similar to the drop in Iran's crude oil production that occurred when sanctions on Iran’s Central Bank were imposed in 2012. EIA also assumes that Iran's condensate production will fall as a result of the new sanctions. Crude oil and condensate exports are a significant source of revenue for Iran, with net oil export revenues estimated at $55 billion in 2017. The exact effect of the sanctions will depend on the total volume of crude oil and condensate that comes off the market and the response from OPEC members and other countries. EIA forecasts that OPEC spare production capacity will average 1.6 million b/d in 2018 and will fall to 1.3 million b/d in 2019, down from 2.1 million b/d in 2017 and lower than the 10-year (2008–2017) average of 2.3 million b/d. This decline creates a market with relatively low spare capacity at the same time Iran and Venezuela are forecast to experience production declines. The total volumes of crude oil and condensate coming off the market will become more apparent in the months following the full implementation of sanctions in November. However, the response of other producers to compensate for lost supplies from Iran is also uncertain. Significant differences between any potential production response and the actual volumes taken off the market would likely result in increased price volatility. The higher crude oil prices at the end of 2018 and in 2019 will likely support increased global crude oil production. EIA forecasts U.S. crude oil production to increase by 1.0 million b/d in 2019. 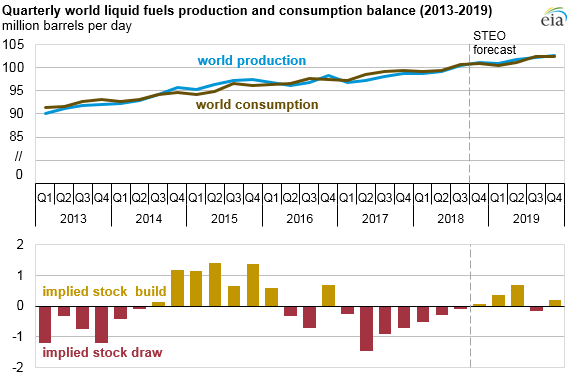 EIA forecasts total global liquid fuels inventories to decrease by 200,000 b/d in 2018, followed by an increase of 280,000 b/d in 2019.